The GT Series immediately followed the F-Series and were introduced in 1965, and produced through 1967 although they appeared in catalogs and price lists as late as 1968. I find this series really interesting for a number of reasons; Martin, a traditional and highly respected acoustic maker suddenly made a major effort to go after the rock and roll generation and the rise of the electric guitar as the next big thing in the musical instrument business. 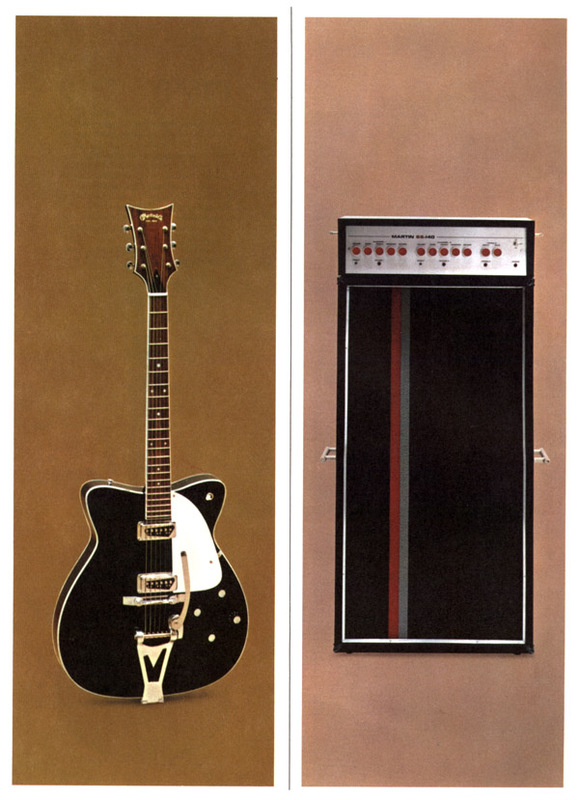 The advertising, the copy, the instruments themselves, were a radical departure from the norm. People look at the production numbers for the GT – over 1,200 instruments in three years – and dismiss them as non-starters. However, in the mid 1960’s, quality instruments were made in much smaller numbers. More GT-75’s were made in these years than Gibson Firebird V’s or flying V’s, for instance. Just as the F-series introduced some firsts for Martin, the GT series was their first guitar with an in-neck adjustable truss rod. The GT’s design was an attempt to update the image of the more traditional ‘jazzer’ F Series archtop, and directly compete with the thinline successes of other US manufacturers. The neck, now bound, joined the body higher to allow better upper fret access, the plexiglas bridge was gone, replaced with aluminum, and the headstock (on most examples) broke from Martin tradition and became what was known as a ‘batwing’ shape. Even the trussrod cover received the pointy treatment and became triangular. Electronics were identical to the F-55 and F-65 models, as was the optional Bigsby vibrato, using the same Martin version of the DeArmond single pole pickups and same control layout of two volume and two tone controls with a three way selector on the treble bout. There were some prototypes, the XTE-70 was the prototype for the GT-70 and the XTE-75 was the prototype for the GT-75. Three of each were made in 1965. One, single prototype bass model was made, the XGT-85. This had a single pickup, and shared the batwing headstock design. At least one early GT-70 (the one I have seen a photo of is in burgandy with a Bigsby) had a different headstock decal, with MARTIN in gold block capitals. Most books and documentary evidence on these instruments stem from a single source which is not completely accurate. Please see the ‘Variations’ section below for some details on the variants that don’t follow the conventional history. Initially, the model range consisted of two models offered in two colors. 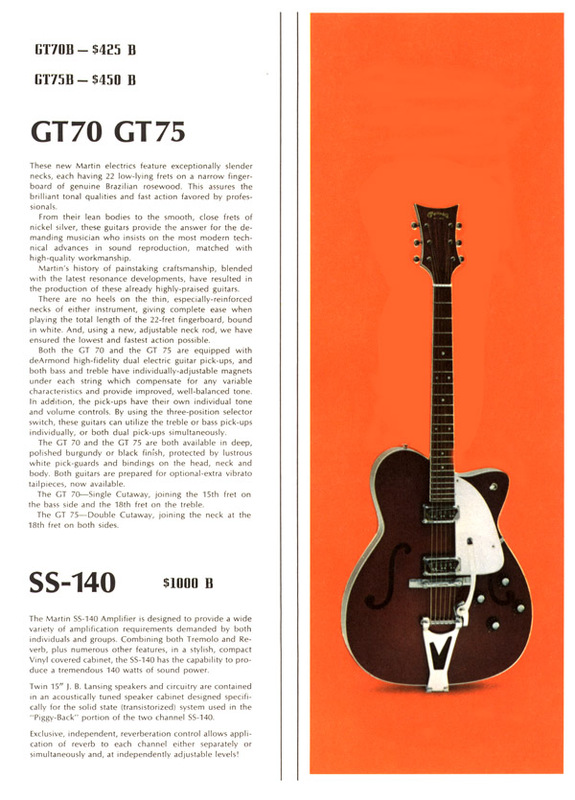 The GT-70 was a single cutaway, produced in 1965 and 1966 only, and the GT-75 a dual cutaway produced 1965-1967. Apart from the cutaways, the guitars were identical. Each model was originally offered in burgandy or black. The GT-75 was a ‘proper’ double cutaway, avoiding the compromise of the F-65 double cutaway, with the body joining the neck at the 18th fret. Both the GT-70 and the GT-75 were offered with an optional Bigsby vibrato. The Bigsby equipped versions were known as the GT-70B and GT-75B. 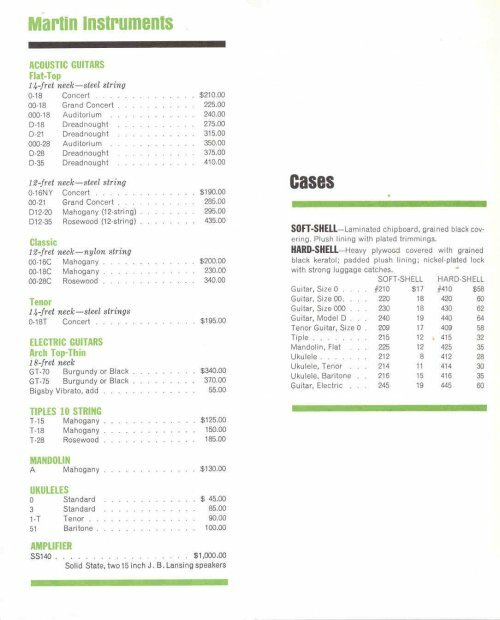 Launch pricing was $370 for the GT-70 and $395 for the GT-75, with $55 extra for the Bigsby and $60 for the hard shell case. By January 1966 the prices for the GT-70 and the GT-75 were dropped to $340 and $370 respectively. This is completely undocumented: a change came in early 1966 when the burgundy color was dropped and a brighter (fire engine) red was substituted. Chances are if you see a burgandy GT it was made before March/April 1966. Sometime between September and the end of 1966 the GT-70 stopped production altogether. 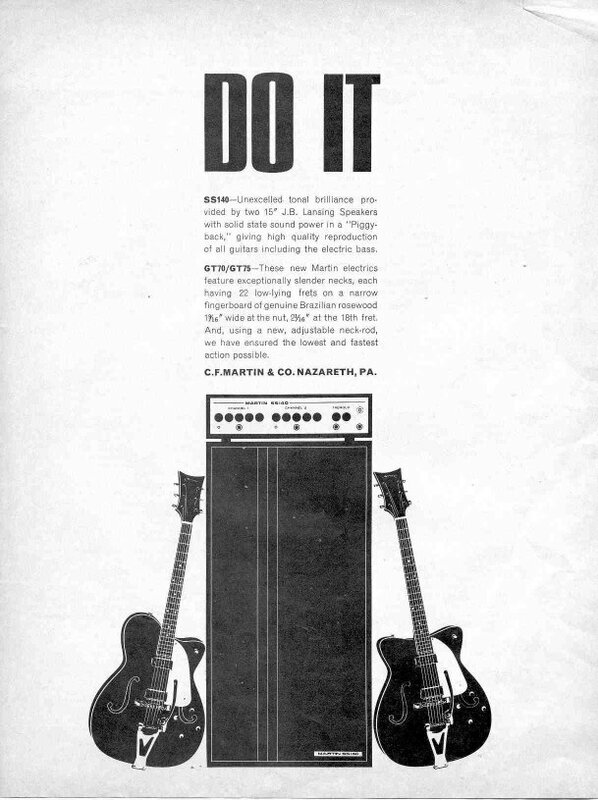 A 12 string version, the GT-75-12 was briefly offered in 1967. It is not known how many were made, but other sources that quote only three being made are inaccurate. 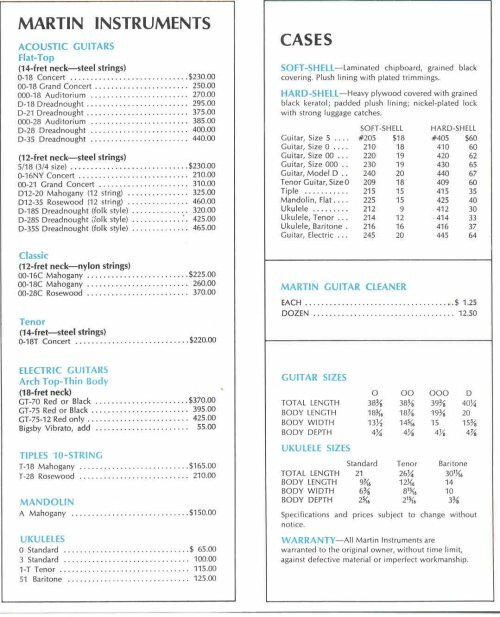 Although the GT-75-12 was Martin’s first (and only) 12 string electric guitar, and obviously offered for retail sale as it appears in the price lists, it could not generate much enthusiasm. In order to accommodate twelve tuners a different headstock was used on the twelve string, a more conventional Martin oblong but slightly elongated to accommodate the tuners. All GT-75-12’s were red in color and were not offered with the Bigsby vibrato option. The original price was $425 excluding case. As with the F-Series, the serial numbers are six-digit numbers shared with the rest of the Martin line produced in these years, and can be found through the F hole. The model number is also visible, you know you have a prototype as it will say ‘XTE’ instead of ‘GT’. Interestingly the GT-75-12 just says ‘GT-75’. OK, let’s talk about variants. One thing that I have learned in researching this is that every time I think that I’ve found all possible undocumented variants, I find yet another one that was previously thought not to exist. One of the dangers of relying on other material that has been printed to date is that it all stems originally from Mike Longworth’s book, which was put together from factory records of the period, and that research shows that these records are incomplete. Variant 2 – the non-batwing headstock guitars: The second variant is the GT-75’s produced with an oblong headstock similar to the 12-string model rather than the ‘batwing’ headstock. It is not known how many of these were made, I have seen four and there are probably quite a few more. I initially thought this GT-75 was really a parts bin special, using up surplus GT-75-12 headstocks, but have since realized that every one of these guitars I know of predates all known 12 strings. I have also seen a photo of one GT-70 with this headstock, although I have not inspected the physical instrument. Every example of this instrument I have seen was made in 1966. Variant 3 – Left Handers: This one really took me by surprise, there was one left hander made, a GT-70-L serial number #214400, and it was red. You can see a picture of it here, with kind permission of Mark Stutman of Folkway Music in Ontario, Canada. I’ve only just started looking at this, but the GT series have some recent devotees. Miles Kane of The Rascals and The Last Shadow Puppets frequently uses a black GT-70 with Bigsby as can be seen here and here on YouTube. Alex Turner of the Arctic Monkeys has a red GT-75 with a non-batwing headstock (i.e a Variant 2 guitar) in his lineup as can be seen here. Previously Skip Spence of Moby Grape played a GT-75, and in fact so did Chris Martin (that’s right, CF Martin IV). “My social life’s a dud, my name is really mud!” snarled Sean Bonniwell on the Music Machine’s “Talk Talk,” the most radical single to be heard on Top Forty radio in late 1966, and he did it playing a GT-75 as can be clearly seen here. 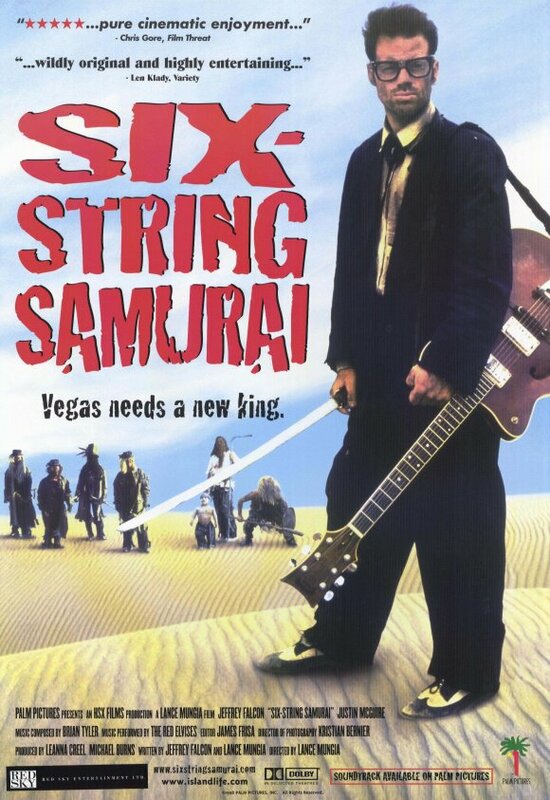 I’m indebted to Don Gray for pointing out that a GT-70 (albeit a modified one) was featured in the 1998 movie ‘Six String Samurai’, there are some interesting shots on IMDB here. The batwing headstock with Martin logo can clearly be seen in these shots and on the DVD cover. GT Series instruments were made between 1965 and 1967: just 453 GT-70’s and 751 GT-75’s. GT-75-12: #218391, #218405, #218411 (all 1967). These numbers are incomplete, please use with caution. I recently bought a Martin GT-75. The body binding also looks more luxureous than the original. Could this be a special order of some sort? I can send pictures if needed. A GT70 was my first guitar. At 8 years old. While the neck was great at that age, as an adult the guitar became almost impossible to play with the big mitts I have. The Martin is long gone now, although I found it advertised for sale a couple of years ago in New York. I recognized a couple of dings in the finish from my youthful carelessness. Now that I’m in my 50’s… I wish I had that guitar still. I wonder if this is one of the known ones? Thanks for the very informative article. I have a Burgundy 1966 GT-70B (217042) that’s in near museum shape. It doesn’t qualify as a variant (so far as I can tell), but if you ever need pictures/info on a standard all original GT70B, let me know. That would be my understanding – the 12 string headstocks were re-used as 6-string in this variant, probably because they’d cut too many blanks, or run out of the batwing blanks for a while, or for production reasons decided to stick to just one blank. I checked my non-traditional headstock (Bigsby)GT-75 and found the serial number to be 218661 (It’s hard to tell if the second 6 is a 6 or an 8). So, that would mean, it was a POST 12 string version. One of the stories I heard was that the Martin folks were trying to fill orders as the end of production of the model, and they used whatever parts that they DID have. I have one of the variants…but am not the original owner. GT-75B . It has the elongated, non-batwing headstock…and a Bigsby. I’ll hopefully get you the serial number…the guitar is presently blocked from seeing by a bunch of gear!